Low Angle Haze, What is it? Why does it occur? What window films are affected by it? What films have the lowest amount of LAH? This page will try to answer these questions so you can decide if a high heat rejection film is for you. 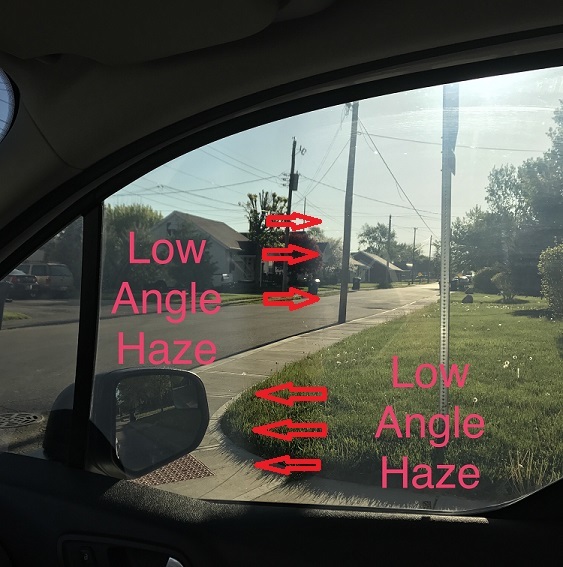 Low Angle Haze - What is it? 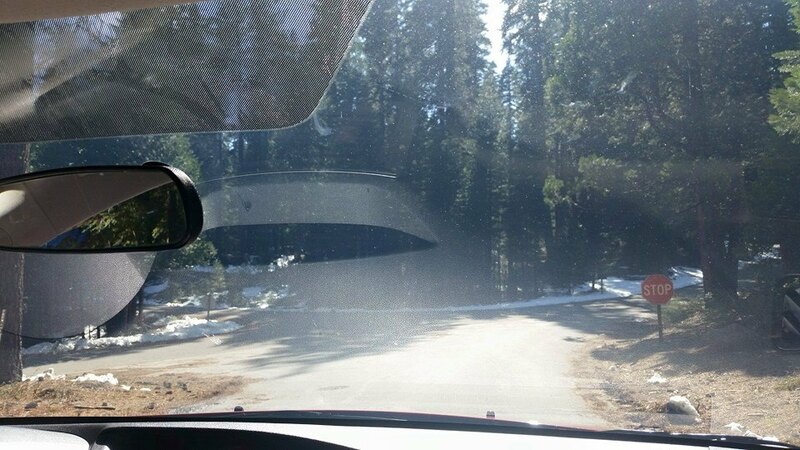 This foggy appearance - what is commonly referred to as LAH in the window tint industry is a phenomenon that has only recently become known. In fact, many tint shops are unaware that such an issue exists. Try calling any tint shop in your town and ask them if they have ever heard of LAH and they will reply with "Uh... what?!?" That's because until recently - about the last couple years - no one knew what it was. And because the films that have this issue are not sold and installed everywhere, many shops will not have any idea what it is. Haziness or cloudiness in the film - The result of inferior manufacturing. LAH is the condition that afflicts many high heat rejection "ceramic" window films. When the sun is at a low angle in the sky, this foggy appearance is most pronounced. The higher the IR rejection (Infra-red rejection), the higher the LAH. Many manufactures are trying to get the IR rejection to 100% by packing their IR films with ceramic particles so densely that IR wavelengths are unable to penetrate them. High IR rejection is great! But High visibility is even more desirable, especially in an automobile where driving demands optimum clarity for the driver to operate the vehicle safely. Many window film makers are struggling with this issue in obtaining a highly visible ceramic film with a high IR rejection while keeping the LAH at a minimum. LAH is the result of Nano particles of ceramic and / or carbon clumping or sticking together in the manufacturing process, creating a foggy or cloudy condition. LAH - What window films are affected? Typically, the films affected by this foggy appearance are films made with Nano Particles of Carbon, and Nano Particles of Ceramic. The difference is in the manufactures who are able to reduce the cloudiness while still maintaining a High IR rejection. What films have the lowest amount of LAH? When we researched carrying ceramic window films, we actually hesitated to do so due to this very issue - cloudiness when the sun sets at a low angle. We had all the makers and their films in the shop one at a time and installed various films. Most we installed had this cloudy look after they were on the vehicle. The film we now offer has the lowest percentage of Low Angle Haze of ALL the manufactures and we feel very confident of its performance and quality. So, YES... Both our NanoCeramic and our ULTRA NanoCeramic IR98 have a little haze to them. BUT, they are the most optically clear ceramic films on the market and will blow you away with their performance.